In ancient times, during the ever-lasting battle of Rome and Greece, two gods were manifested: Ares and Athena. Ares, the greek god of war, represented the violence in war: bloodshed, damage, death. Athena, the strategist: battlemaps, plans, suprise attacks. While Rome had these same gods, a new one rose: Bellona. She took on the personalities of both, waiting to strike, but striking ruthlessly. I'm IceColdPappsi, here today to bring you a Bellona guide. Without further ado, LET US BATTLE! In SMITE, Bellona is a warrior, a sort of Jack of All Trades kinda gal. This means she has CC to lockdown targets for a limited amount of time, initiate with minor penalties, and be a huge presence in every fight, whether it be a gank or a full on frontal assault. This along with her skills and team composition flexibility, makes her recognizable as a force to be reckoned with. Time to train you. Bellona is such a master of arms, she carries 3 different weapons. Note: Each of Bellona's skills have a different auto attack chain. Also, each weapon lasts for 7.5 seconds. Every successful basic attack that Bellona gives or recieves stacks 3% movement speed and 4 protections of both kinds, and stacks up to five times. The great thing about this passive is that it gives you incentive for getting in people's faces. Initiate, and you'll be harder to kill because of it. This is a short dash with a cone targeter. Enemies hit with the cone are damaged, slowed, and Bellona receives 1 stack of block. Afterwards, she attacks with a sword and shield, gaining a stack of block every 3 successful basic attacks. Note: The targeter of this ability does move depending on the distance between you and the next enemy. When dashing, make sure there are no enemies in front of you to ensure maximum dash distance. This is one of two disengages. You will level this early to get the benefit of the slow, but seeing as it does not provide a lot to the table, it is best you max it third. Block is a reflect. It absorbs the next basic attack, nullifying the damage, and then dealing 30% of that damage to a small area around Bellona. This ability is good when boxing, or 1v1ing, so u can hit them with damage, slow them, take one less basic attack of damage, and reflect back at them, WHILE you are still hitting them. This is a spin that damages all enemies in a radius once, and then slams down in a short line in front of you. The damage of the spin increases for each additional god over 1 that you hit. Afterwards, she will attack with the hammer. This is your main clear. Not only can you hit all minions with it if they are compact enough, the slam can also hit the archers if you're at the brutes. Maxing this first just maximizes your clear, helping you level faster. Note: Make sure not to accidentally hit the enemy when spinning, or else minions around you will start attacking you, and at early stages of the game, this can deal considerable damage. This ability is good for when you are getting teamed up on. If the enemies are surrounding you, you can spin to get extra damage on the slam, and end up killing someone, making it more of an even fight. This is a long line attack that disarms all enemies hit. Afterwards, Bellona attacks with the Bladed Whip, which has extended basic attack range, and every 3rd basic attack heals her. This heal increases with level. This is your main sustain, and will be maxed second. It can damage all minions quicker than Bludgeon, and will come in a pinch when you're low. Disarming someone makes them not able to basic attack for the duration, just like a silence puts a hold on abilities. This is so good in a 1v1, when you know the opponent has used some of their main abilities, it can put their only remaining source of damage on hold until their abilities come back. You also get rewarded when hitting them because the damage they do will be healed back to you in time. This is a leap. After landing, you plant a flag that gives Physical protections and power to all allies, including minions, inside the radius. During the leap, you are CC immune, and any enemies hit in the center of the radius are damaged and stunned. This is your second disengage. Seeing its default cooldown of 75 seconds for a temporary power and defense buff to even minions(! ), you can afford to use this sometimes to keep yourself alive. However, this is also your initiate. Jumping over a wall to stun some people can help give your team some peel. Level this any time you can. Peel is when CC is applied to the opponent to help your more damaging teammates get some damage off, "peeling" away their health until they retreat or die. On the other hand, Peel is also any CC applied to an enemy who is chasing a teammate, peeling them off of your ally until they get to safety. Equip yourself! Time to explain battle weapons and techniques. You absolutely NEED this starter item. Seeing as your Bludgeon is going to be leveled first, it helps with your mana and health sustain. The reason you need it, however, is because it procs on every instance of an enemy hit with a basic attack. Meaning that if you hit 3 enemies with one basic attack, Death's Toll's passive will apply, 3 times. This is different from hunters like Izanami and Rama, who, while hitting multiple enemies, damage in a line, therefore proccing only once. These are your boots. Warrior Tabi gives 20 more power than Ninja Tabi, but Ninja Tabi gives attack speed and mana. It all depends on how you want to build. Say you like more of the damage items, opt for Ninja Tabi, as some of them give attack speed, and you'll want to hit more basic attacks to get the full effect of those items. On the other hand, Warrior Tabi will benefit you more in a tankier build, as you need power to help your abilities scale, and most of the tanky items don't give power to work with. In the end, it all comes to personal preference. Breastplate of Valor gives 65 physical protections, 300 mana, 10 MP5 (Mana regenerated every 5 seconds), and 20% cooldown reduction. This is great against physical opponents, as they will hurt you less. Also, Mana and MP5 make a great combo so that while you are waiting for your abilities to come back, you are regenerating mana at a faster rate then before. It is also an added benefit that towers, phoenixes, titans, and minions will all hit you for less because they all deal physical damage. Genji's Guard gives 70 magical protections, 20 MP5, and 10% cooldown reduction. Also, if you were to be hit by a magical ability, all of your cooldowns will be lowered by 2 seconds, and this happens every 30 seconds. While it does lack mana, it makes up for in usability. Seeing as you will pick this item against a magical opponent, their attacks will make your attacks come quicker. Comparing them, Genji's Guard gives more protections, even if of a different kind, but Breastplate of Valor gives mana. What sets the two apart is the passive of Genji's Guard making their cooldown reduction almost alike. Now, why is cooldown so important? It is to help your clear. It also helps your boxing, so that you do not have to rely on your basic attacks so much. This is a huge magical defense item. 60 magical protections, 200 health, and 20% CC reduction. Additionally, if you are below 30% of your maximum health, a shield will generate, with health equal to 150+10x, where x is your level. At level 20, your shield health will 350. This shield lasts for 20 seconds, and can appear every 60 seconds. This will be in your build to help your survivabilty. Not only becuase of the passive, protections, and health, but the CC reduction makes all forms of CC last 20% less than they would, meaning you take less CC=less damage. This is also another big defense. This gives 35 protections of both kinds and 250 health and mana. Also, every kill or assist you earn adds 3 more protections of both kinds, maxing at 10 stacks. There are only 6 items in the game that give protections of both kinds, with 1 being exclusive to magical damage dealers ( Stone of Binding), and 1 being exclusive to physical damage dealers ( Shifter's Shield). This is a prime example of those type of items, with the other one being Mantle of Discord. Having this in your build rewards with tankiness for being involved in fights. This one is for the presence. 40 physical protections and 300 health. Its aura deals 40 magical damage to those around you every second. Note: Penetration and protections do factor into this damage. This item has an up-and-downside. Upside, sticking close to enemies will put even more damage on them, and can even kill people. Downside, if there are any mesmerizes in your team (Mesmerize=Stun that is interrupted by any instances of damage), this item will negate that. Kumbhakarna is famous for his 3 second mesmerize, which is a potential stun, but having this near him will negate such a huge CC. This is another rare item, one that gives protections and power. 40 power, with 20 protections of both kinds. When above 50% health, you gain 20 power. When below half health, you get 20 more protections of both kinds. This item is good when you have a good balance of protections, but you want more power. You can get this item to get both. It is also good when going in, you have more power, and when disengaging, you have more protections. These two are less power, and more boxing. Ichaival steals 10 physical power from an opponent you hit with a basic attack and gives it to you, maxing at 3 stacks, and Silverbranch Bow does the same thing, but against magical enemies and reduces theirs by 15. It is obvious why it is for boxing. Note: You can still gain power from hitting magical enemies with Ichaival and the same for Silverbranch Bow. This is because it gives power, then reduces theirs, so if they don't have that power type, you still gain power. This should be your main damage item. 40 power, 10 penetration, 150 mana, and 20% cooldown reduction. The cooldown reduction helps your clear, penetration ups your damage, and the mana is to compensate for the amount of abilities you will be using. This item is one of the premier boxing items. 25 power and 300 health. Also, hitting enemies with basic attacks will reduce their movement speed and their attack by 30% and 15% respectively, for 1.25 seconds. After the duration, new basic attacks will start the effect again, and so on. The health helps your survivability while boxing and the passive makes your basic attacks easier to hit, and their damage output slowed. Big daddy ADC damage. 40 power and 15 attack speed. Every basic attack against a god will deal an additional 4% percent of their health as damage. What this spells is that potentially, you are actually removing 5-6% of their health with every basic attack. Note: This is true damage, and ignores protections. This is what helps your damage immensely. Not only are you dealing damage, you are literally taking out chunks of their health. Against beefier targets, this can mean 100+ damage just from the passive. Can't forget Grand Pappy Pen. 30 power, and 33% penetration against EVERYTHING. Nuff said. Fast as f***boi! 300 health, 20% CC reduction, and 10% movement speed and attack speed. Also, when slowed, it is negated and you move 20% faster for 4 seconds, every 30 seconds. This can help your escape, so that when an enemy is chasing you and attempts to slow your escape, you instead run for your life. This is for the sustain. 400 health, 10 HP5, and 10% Cooldown reduction. Every kill or assist you get on an enemy god or objective, such as Gold Fury, Fire Giant, and any structure, will regenerate 3% of your health and mana every second over the next 5s. New instances will refresh only the duration, meaning that if you have 1 second left, it will go back up to 5, regenerating 12% of your health and mana this time. This is good when engaing in a fight and quickly leaving. During your exiting, if you were to get an assist, the effect will proc, giving you a bit of strength left in you to still fight. Never surrender! This is for the teamfight. 40 power and 200 health. If an enemy were to be any under CC, they take 10% extra damage from you. This helps your teamfight numbers because CC is EVERYWHERE. This season is full of it, and with it, comes lots o' confirmable damage. Hiya! A whopping 50 physical power, 100 health, and 10% movement speed. This has a bit of both worlds, because every enemy near you gives you 5 physical and magical protections, capping at 5, which is the exact size of a whole team. This means that standing in the middle of everyone will make you harder to kill, while you dish out more damage. Truly a sword for Bellona. Antiheal. AntiHeal. ANTIHEAL! You don't know how rage inducing it is to see an enemy team with f***ing Sylvanus support, Ra mid, Chang'e solo, Cupid ADC, and your teammates are just dumbfounded at how much they can heal, like, "Wow, I hit him with my whole kit and he's still full health! ", like there aren't items in this game that reduce the effectiveness of these abilities, yet not A SINGLE TEAMMATE has picked up A SINGLE ITEM OF THIS KIND, like OMG, QUIT F***ING COMPLAINING ABOUT CHANG'E'S ******* 500 HEAL EVERY 10 SECONDS WITH Rod of Asclepius LIKE YOU CAN'T DO S*** ABOUT IT! JUST MAKES YOU WANT TO THROW YOUR PC ACROSS THE F***ING NEIGHBORHOOD AND SCREAM AT YOUR PARENTS AT WHY THEY ARE ALIVE!!!! Regardless, Pestilence provides 80 magical protections and 200 health. Everyone in a radius of 55 units has their healing from abilites, items(lifesteal and such), and regeneration(HP5 and such), halved. While the item protects against magical enemies, its aura is universal, so it is very potent when enemies try to heal in combat. They try to kill you, end up killing themselves. 80 physical protections, 200 mana, and 20 MP5. All basic attacks that hit you are reflected back to the owner for 25% of the original damage, as physical damage. Great for boxing, as basic attack matches are very common in the solo lane, and this item can actually kill. Note: Penetration does play into its damage. The less protections they have, the more effective this item's passive. Did someone say, even more boxing? 200 health, 15% attack speed, and 10% movement. It has an aura that reduces the attack speed of anyone within 55 units by 20%. Also, when you basic an enemy, it reduces their healing by 15%, stacking up to 3, for 5 seconds. This not only gives you an edge, pumping out more consistent damage then your opponents, but it also reduces the healing of any you hit, meaning they will regenerate less health when you guys aren't fighting. I like the guide over all very potent, of anything I think you should add an Executioner to the items since it can work very nicely in some situations when the ADC goes for Titan imo. 116840 Anothny I like the guide over all very potent, of anything I think you should add an Executioner to the items since it can work very nicely in some situations when the ADC goes for Titan imo. Executioner is more for hard hitters, which is why it is a popular ADC item. They use it to get their autos to actually affect tanky opponents. 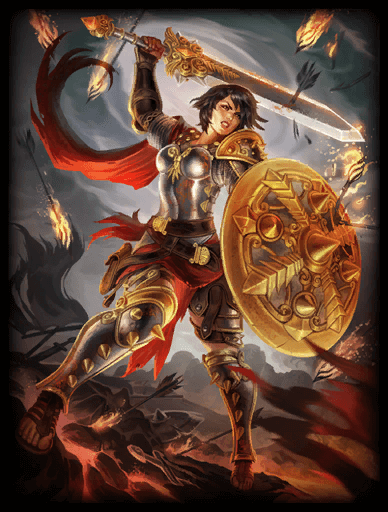 Bellona isn't really an ADC, just that each of her abilities affect her autos drastically. Which means that building ability based is very great when considering the teamfight side of her. However, I will add it in as a boxing item, as I do have a lot of those, because most of the solo lane early and mid game is just pressuring the other out of lane. 117000 IceColdPappsi [[Executioner]] is more for hard hitters, which is why it is a popular ADC item. They use it to get their autos to actually affect tanky opponents. [[Bellona]] isn't really an ADC, just that each of her abilities affect her autos drastically. Which means that building ability based is very great when considering the teamfight side of her. However, I will add it in as a boxing item, as I do have a lot of those, because most of the solo lane early and mid game is just pressuring the other out of lane. Thank you. 116822 IceColdPappsi Finished the items section. Papps, quick note for Bludgeon...in the "important to know" or "ability overview" section, you might want to mention that normal basics with the hammer also have an AOE effect, so even if you're CCd out of finishing the 2-hit, you'll still have added function against multiple minions. Ability Overview: This is a spin that damages all enemies in a radius once, and then slams down in a short line in front of you. The damage of the spin increases for each additional god over 1 that you hit. Afterwards, she will attack with the hammer. Leveling: This is your main clear. Not only can you hit all minions with it if they are compact enough, the slam can also hit the archers if you're at the brutes. Maxing this first just maximizes your clear, helping you level faster. Important to Know: This ability is good for when you are getting teamed up on. If the enemies are surrounding you, you can spin to get extra damage on the slam, and end up killing someone, making it more of an even fight. Like what I did with the colors? eh? eh? Is that true what you said about Death's Toll? I'm not sure that's accurate...I think any AOE/multi-hit ability might have reduced function, not just gods like Iza...would love to have this confirmed in jungle practice. To be become a more complete guide, would like to see some gameplay tips, ability combos, etc. But this is a solid base overall. 116172 Branmuffin17 Papps, quick note for [[Bludgeon]]...in the "important to know" or "ability overview" section, you might want to mention that normal basics with the hammer also have an AOE effect, so even if you're CCd out of finishing the 2-hit, you'll still have added function against multiple minions. I'm torn between feeling that you're hiding too much behind spoilers, and it being really nice for easier navigation between sections...it's especially interesting in the skills table...think you could take those out of spoilers, and maybe just title the specific topics within... [spoiler=example] [color=#0080ff][b]Ability Overview:[/b][/color] This is a spin that damages all enemies in a radius once, and then slams down in a short line in front of you. The damage of the spin increases for each additional god over 1 that you hit. Afterwards, she will attack with the hammer. [color=#ffffff][b]Leveling:[/b][/color] This is your main clear. Not only can you hit all minions with it if they are compact enough, the slam can also hit the archers if you're at the brutes. Maxing this first just maximizes your clear, helping you level faster. Note: Make sure not to accidentally hit the enemy when spinning, or else minions around you will start attacking you, and at early stages of the game, this can deal considerable damage. [color=#ff0000][b]Important to Know:[/b][/color] This ability is good for when you are getting teamed up on. If the enemies are surrounding you, you can spin to get extra damage on the slam, and end up killing someone, making it more of an even fight. [/spoiler] Like what I did with the colors? eh? eh? Is that true what you said about [[Death's Toll]]? I'm not sure that's accurate...I think any AOE/multi-hit ability might have reduced function, not just gods like Iza...would love to have this confirmed in jungle practice. To be become a more complete guide, would like to see some gameplay tips, ability combos, etc. But this is a solid base overall. 1. I thought I did explain that Bludgeon hits in a "cone" not an AoE, but it wasnt clear enough. Will rewrite so that note is more noticeable. 3. Yes. Death's Toll does proc multiple times when multiple enemies, in the same lifesteal does in Made You Look for Mercury. 4. Didnt get to finish guide before deadline, but will finish with all of its glorious BB-Coding! 116240 IceColdPappsi Thx for commenting, Bran! 1. I thought I did explain that Bludgeon hits in a "cone" not an AoE, but it wasnt clear enough. Will rewrite so that note is more noticeable. 2. I see what you did there ( ͡° ͜ʖ ͡°) Will edit Ability tables. 3. Yes. [[Death's Toll]] does proc multiple times when multiple enemies, in the same lifesteal does in [[Made You Look]] for [[Mercury]]. 4. Didnt get to finish guide before deadline, but will finish with all of its glorious BB-Coding! Got as far as I could in a day, but sadly couldn't finish the items section (called it). Will finish guide after contest. 115870 IceColdPappsi Got as far as I could in a day, but sadly couldn't finish the items section (called it). Will finish guide after contest. Won't be on tomorrow. Homework and school the day after. So this is it for me. Good night! 115872 IceColdPappsi Won't be on tomorrow. Homework and school the day after. So this is it for me. Good night! Hey Pappsi nice to see that this Bellona guide is going on nicely. I see you're now using advanced BBcoding some lended from Bran I use the same code as well. I'm happy that you are also doing a Bellona guide. When I update my own we will have 3 season 4 guides for Bellona. So keep working on this guide I can't wait to see the finished product. 115838 overld1 Hey Pappsi nice to see that this [[bellona]] guide is going on nicely. I see you're now using advanced BBcoding some lended from Bran I use the same code as well. I'm happy that you are also doing a [[bellona]] guide. When I update my own we will have 3 season 4 guides for [[bellona]]. So keep working on this guide I can't wait to see the finished product. Actually, I've been using Zero's guide all this time for the table's section. And GL on ur guide! 115860 IceColdPappsi Actually, I've been using Zero's guide all this time for the table's section. And GL on ur guide! Thx I'm pretty sure that the Scylla guide is going to win as well. 115869 overld1 Thx I'm pretty sure that the Scylla guide is going to win as well. So far looking good. I would suggest providing some more information on the abilities, however. You show what an ability does and when to level it (and your reasoning behind why you level it at that point). That's really good, but you should provide some more details. One thing you can mention is that you can effectively clear by combining both Bludgeon and Scourge. Another thing you can mention is to be aware when using Bludgeon that you don't accidentally hit the enemy god before the wave is cleared (unless this is your intention to), as you'll draw minion aggro, and that'll take HP away like there's no tomorrow in the early game. These are just a few ideas. I also would advise against using a chalice ( Chalice of Healing) as a starting gear item. Chalices are, in my opinion, an option to negate the eventual stacking cost of constantly having to re-buy Healing Potion or Mana Potion, but in the early game you should stick to potions. Not only can you carry more by doing so (4/4), you also have more sustain because of this, since you can carry more potions. You should get chalices somewhat mid to late game should you decide to get them instead of potions. Last but not least, I do like your "peel" description. However, "peel" more commonly refers to getting an enemy off of your teammates. Say a Loki is chasing your Skadi, you can use Eagle's Rally to stun said Loki and "peel" him away from said Skadi. That's not to say your description isn't right, as you can certainly use CC to "peel" an enemy's health away, but just letting you know. Good job so far, Peppsi, keep it up. 115796 xZeroStrike So far looking good. I would suggest providing some more information on the abilities, however. You show what an ability does and when to level it (and your reasoning behind why you level it at that point). That's really good, but you should provide some more details. One thing you can mention is that you can effectively clear by combining both [[Bludgeon]] and [[scourge]]. Another thing you can mention is to be aware when using [[bludgeon]] that you don't accidentally hit the enemy god before the wave is cleared (unless this is your intention to), as you'll draw minion aggro, and that'll take HP away like there's no tomorrow in the early game. These are just a few ideas. I also would advise against using a chalice ([[chalice of healing]]) as a starting gear item. Chalices are, in my opinion, an option to negate the eventual stacking cost of constantly having to re-buy [[healing potion]] or [[mana potion]], but in the early game you should stick to potions. Not only can you carry more by doing so (4/4), you also have more sustain because of this, since you can carry more potions. You should get chalices somewhat mid to late game should you decide to get them instead of potions. Last but not least, I do like your "peel" description. However, "peel" more commonly refers to getting an enemy off of your teammates. Say a [[Loki]] is chasing your [[Skadi]], you can use [[Eagle's Rally]] to stun said [[Loki]] and "peel" him away from said [[Skadi]]. That's not to say your description isn't right, as you can certainly use CC to "peel" an enemy's health away, but just letting you know. Good job so far, Peppsi, keep it up. Pappsi*, thank you kind sir! Thx for the feedback! Will have 3 spoilers on each skill now: 1 for description, 1 for leveling and why, and 1 for tips and tricks. I FINALLY FIGURED OUT TABLES! Expect to see them all over the guide when listing. Am starting on items right now, will be updated by tommorrow. Don't think i'll be able to finish the guide in time tho, so are there any pity points, or ways to get placed and win without having a complete guide? 115829 IceColdPappsi Pappsi*, thank you kind sir! Thx for the feedback! Will have 3 spoilers on each skill now: 1 for description, 1 for leveling and why, and 1 for tips and tricks. I FINALLY FIGURED OUT TABLES! Expect to see them all over the guide when listing. Am starting on items right now, will be updated by tommorrow. Don't think i'll be able to finish the guide in time tho, so are there any pity points, or ways to get placed and win without having a complete guide? A good build - This would be the most important as it's the heart of your guide. A skill chapter - You have this, but basically explaining in detail how to use a god's abilities in the most effective way is very important. Item chapter - To explain the items chosen, convince those who read your guide about why you chose those items and why you think what you chose would work. Also the Peppsi was intentional, but okay. 115832 xZeroStrike To alleviate your chances of winning without having an entirely complete guide you'll have to have the most important things set: A good build - This would be the most important as it's the heart of your guide. A skill chapter - You have this, but basically explaining in detail how to use a god's abilities in the most effective way is very important. Item chapter - To explain the items chosen, convince those who read your guide about why you chose those items and why you think what you chose would work. Gameplay chapter - How to act as the god you're playing, in the role and gamemode you're playing that god in. A warrior in the role of the solo role would act different than a warrior in the jungle role, and would definitely act different than a hunter. How to play the god is a key-point of information that a guide should attempt to bring across, as there's no point in knowing how to use a god's kit and having a good build, when you don't even know you're NOT supposed to walk under the enemy tower at level 1 with no minions. (Over exaggerated, but you get the point.) Also the Peppsi was intentional, but okay. Hope this helped, Pappsi. Yeah, I don't think I'll finish the items section, not even talking about the gameplay section. TBH, I did start this a week after the contest started, but it was a fun project! 115850 IceColdPappsi Yeah, I don't think I'll finish the items section, not even talking about the gameplay section. TBH, I did start this a week after the contest started, but it was a fun project! Try to make the most of it, before the contest judging period starts. You'll have the best chances the more you have on there, as long as the info is valid, of course. And even if it doesn't enter the contest, isn't finished before it or doesn't win the contest, it's still an good guide with great potential that I do hope you you'll continue with. 115852 xZeroStrike Try to make the most of it, before the contest judging period starts. You'll have the best chances the more you have on there, as long as the info is valid, of course. And even if it doesn't enter the contest, isn't finished before it or doesn't win the contest, it's still an good guide with great potential that I do hope you you'll continue with.